Ultimate Guitar Techniques Series. By Stuart Bull. Road Rock Lick Library. Jazz, Technique, Pop, Instruction, Blues, Funk. DVD Only. Lick Library #MUSRDR0194. Published by Lick Library (HL.393085). This superb DVD covers funk guitar styles of the greats, from James Brown to Earth Wind and Fire, Chic and many more. Right and left hand techniques are looked at in detail. The examples played and explained will give you the tools to play funk in many different situations whether it's pop, rock, or your own compositions. 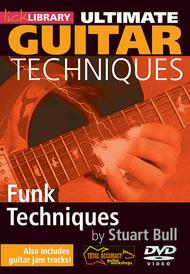 Understanding and playing the funk guitar style can add dynamics and spice to your playing. Backing tracks are provided along with played examples in the package so you can really dig in on this style...enjoy!This superb DVD covers funk guitar styles of the greats, from James Brown to Earth Wind and Fire, Chic and many more. Right and left hand techniques are looked at in detail. The examples played and explained will give you the tools to play funk in many different situations whether it's pop, rock, or your own compositions. 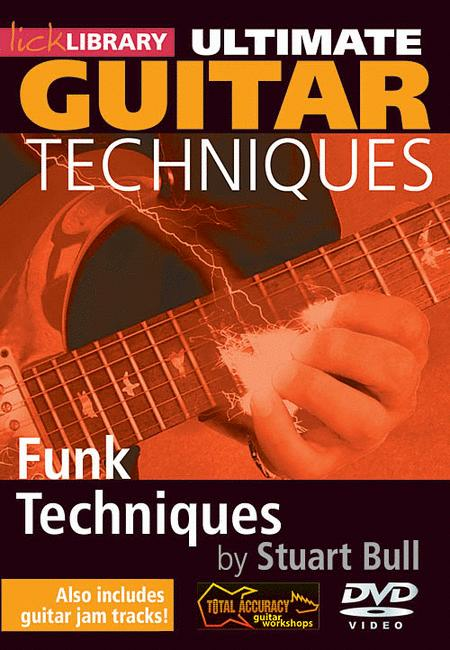 Understanding and playing the funk guitar style can add dynamics and spice to your playing. Backing tracks are provided along with played examples in the package so you can really dig in on this style...enjoy!